About China-developed Loongson CPU. All are not offcial but from my own point of view. Loongson Box is sold at CNY 1599 (US$ 200) without monitor and keyboard/mouse. All Lemote boxes of the pilot run will be delivered to users before Chinese traditional new year, Spring Festival. 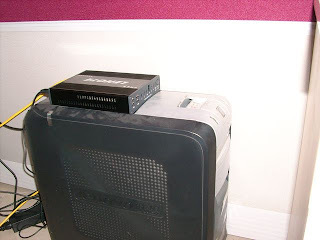 The photo is taken from "SNAiL", a friend of mine on Lemote BBS, showing a contrast between Lemote Box and regular PC. The Box possess Loongson 2E processor of 666MHz, laptop hard disc of 40G, laptop DDR memory of 256M, VGA Card of ATI RADEON 7000M and operating system of Debian GNU/Linux Etch. Are Loongson Boxes cheap? I don't think so. Hardwares seem to be out of date. CNY 1599 may buy a x86 PC with (perhaps) better performance. However, Loongson Box is actually NOT a PC. It is really something else which will change your ways of thinking. Small and lovely, it consumes little power and saves a lot money every month. It is indeed cheap in a sense. And I bet things will get better in future. Are all loongson first users experts on Linux? NO. Some users never used any distribution of Linux before. I am a newbie to Linux, too. I just gave up Windows half a year ago. Both regular users and experts will contribute to Loongson's growth. Is Loongson "Chinese Pentium 4"? At present, the answer is NOT. Loongson 2E generally performs about as same as PentiumIII at same frequency but much faster in pure computing works because it is an RISC. Specially optimized L2E@1G does achieve what Pentium4 1.3G does in SPEC CPU2000 but ordinary L2E@666 doesn't. Loongson is now not as good as some media trumpet but is much better than some rumors said. That's the fact, but I believe that it will be Chinese Pentium 4 in near future. I've been reading your blog with a lot of interest. Keep up the good work! One small comment: the Order Set puzzled me for a few seconds, before I realized you are actually talking about the Instruction Set! Oh, that's my fault!! Forgive me! I am not good at computer science but just a regular Linux user. When I was looking up the "指令集“ in Stardict, it says the Chinese word should be translated into "Order Set". The dictionary misled me. I have just check the Chinese for "Instruction Set". That is "指令组“. Changed "Order Set" to "Instruction Set". Thanks alain! Take it easy! I wish one day I can learn chinese as good as you know english. I understand translation difficulties, as english is not my native language either. I see your ID is ubuntpku. Any relation with Ubuntu Linux :-) ? Yeah, this ID is derived from merging Ubuntu and Peking University(PKU). A friend of mine recommended Ubuntu Linux for me half a year ago. Then I started to get used to Linux. So, alain, you have already mastered at least two languages, your native one and English? That's great! Better than me. I can only speak Chinese and barely English. But writing in English seems to be easier than speaking. I am hoping to move to China sometime this year. That's the best opportunity to learn Chinese language and culture! How do you like Ubuntu? I have been using Fedora for some years, and I am considering switching to Ubuntu, a lot of friends told me good things about it. Great! I will always welcome you when you pay a visit to China. Maybe we can enjoy several days together if you come to Beijing. As I did not use any other distribution of Linux before, I'm not sure if Ubuntu is better than Fedora. Ubuntu seems easy to use for Linux newbies like me, and it supports new hardwares better(perhaps, some friends told me so). Update is fast and a new distribution will come out every 6 months. Technical support from Ubuntu community is also strong, in my opinion. Sorry, I don't know much,really. But Ubuntu indeed absorbs many Windows users to Linux world. Excuse my ignorance, but is it Ubuntu running on Loongson, or a pure Debian distribution? If not, do you think Ubuntu on Loongson would be exciting? I am now only having pure Debian running on Loongson. This is because Debian also supports mips CPU. Since Loongson is built on an altered MIPS III architecture, debian packages are generally portable to Loongson platform. Ubuntu, unfortunately, does not support the new CPU yet. :-( Some Linuxers on Lemote BBS are now trying to transplant Ubuntu to Loongson platform. It will be extremely exciting running Ubuntu on Loongson.I think so. In fact, nearly all instructions in mipsel are implemented, but by Loongson's own way. This CPU also has over 100 specific instructions. So I think maybe a customed distribution of Linux for Loongson is better. And, Chinese is difficult to learn. It is not based on alphabet letters but on characters. But don't worry!I can help you. Now I'm anticipating your visit to China,my friend! I have been reading on Loongson, and if I understand correctly version 2F will be more compatible with MIPS, which would make porting Debian / Ubuntu / others much easier. Is that true? I'll follow your blog with great attention, it looks like exciting times for China! You remind me. Yes, someone on Lemote BBS says Loongson 2F is more compatible with MIPS. But I didn't know Ubuntu along with other famous Linux distributions had a MIPS version except Debian. So perhaps these distributions should be re-compiled on the new CPU no matter if Loongson is fully compatible with MIPS. It's my guess. Loongson 2F is very likely to be fully compatible to MIPS III. Loongson 3 is very likely to be fully compatible to mips64. When Wow Gold wolf finally found the wow gold cheap hole in the chimney he crawled cheap wow gold down and KERSPLASH right into that kettle of water and that was cheapest wow gold the end of his troubles with the big bad wolf. The next day the Buy Wow Goldlittle pig invited hisbuy gold wow mother over . She said "You see it is just as mygamegoldI told you. The way to get along in the world is to do world of warcraft gold things as well as you can." Fortunately for that little pig, he buy cheap wow gold learned that lesson. And he just k4gold lived happily ever after!.